Steven de Selby is not your average hero. He’s mediocre at his job, he’s a disappointment to his parents, and he’s still moping about the girl who dumped him years ago. To be honest, Steve’s a bit of a loser. But his job is pretty unusual – Steve is a Psychopomp, or Pomp as they’re known – a person who draws the dead through to the Underworld and who stalls Stirrers, things that desperately desire to come in the other direction. When the entire Pomp organisation in Australia starts collapsing and almost every other Pomp in the region is murdered, Steve finds himself on the run, fighting for his life and the lives of those he loves. But who is the enemy, and how can he possibly beat such a powerful foe, one on a par with Death himself? There is so much to like about this book. To begin with, I loved the very Australian feel to the story. Death Most Definite is set in contemporary Brisbane (mostly) and as someone who has spent time in that state capital, it was pretty cool to read about places I had visited as conduits to the underworld, or simply as part of the story. But it’s not just about the setting; the book feels Australian on so many levels – the dialogue is especially well done, being a realistic representation of Australian vernacular without dropping into “ockerness”. Jamieson has done an excellent job of ensuring the book at all times has a distinct Australian flavour, divergent entirely from American or British fellows. Secondly, it’s a very great pleasure to read an urban fantasy that doesn’t shy away from gritty realism. Horrible things happen to Steve. He despairs. He wants to give up. He’s not a hero, but he finds the strength within himself, with the support of friends and family, to continue fighting what seems to be an impossible battle. He doesn’t uncover an amazing weapon that helps him carry on, or have astonishing powers that make him stronger or more skilful than his opponents: his struggle is real, and as such, very appealing to the reader. The story itself is fresh and utterly gripping – I’ve read a lot of urban fantasy (and its amorously inclined cousin, paranormal romance), and I’ve not come across anything that tells a story like this one. The role of the Pomp as described in the book is sort of similar to the idea in the television show Dead Like Me, but Jamieson handles it in a unique manner and it by no means suffers by comparison. I interrupted three other books to start reading Death Most Definite and pretty much only put it down for essential tasks, like sleep! The prose is powerful, the action intense and the pace fierce, particularly in the second half of the book. To continue the litany of love, Jamieson’s primary characters are engaging and strong: Steven himself, the dead girl Lissa, Steve’s cousin Tim, and boss Morrigan, are all deftly drawn, as are a number of other characters who play important roles (I hesitate to name too many as some things are fun to find out for yourself!). The lesser characters are more transparent and I found myself actually wanting to know more about some of them, which is most unusual. All play their parts effectively, making each essential to the story. There’s very little to complain about in the novel. If anything, I would suggest that some characters could have been fleshed out more in the context of the story, but I daresay many will gain depth in the continuing books in the series. 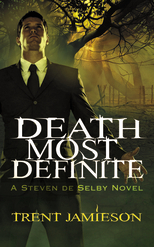 I was delighted that Death Most Definite had a clear-cut ending – the story is complete in its own self, which is a very pleasant change from many series books. Death Most Definite is a darkly absorbing debut novel, compelling from beginning to end. Jamieson is a skilled writer who has earned his stripes in the short-story craft and enters the novel scene with a bang – I see a big future ahead! Disclaimer: I have worked on publications that have published Trent’s short stories in the past. I really liked the role of Brisbane in this story, all those really strong Brisbane settings (and I loved that he started off the story in the Wintergarden food court) – I’d be interested in how this comes across to someone who doesn’t know the city.